It warned American citizens of credible information showing planned attacks by Isis and Al-Qa’ida this Christmas. 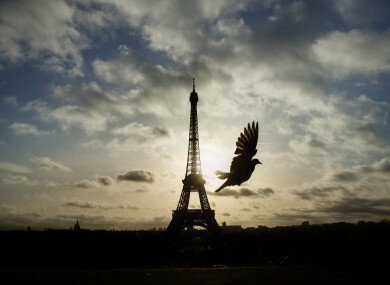 A bird flies in front of the Eiffel Tower during three days of national morning in France last November. THE US STATE Department has issued a warning to Americans about a heightened risk of terrorist attacks in Europe during the festive period. It noted that terrorist attacks have taken place in Belgium, France, Germany and Turkey in the past year, but said it was concerned about the potential for attacks throughout Europe. “US citizens should exercise vigilance when attending large holiday events, visiting tourist sites, using public transportation, and frequenting places of worship, restaurants, hotels, etc,” the statement said. The US warning comes after French police said last night they prevented a terror plot by breaking up a terror ring over the weekend. Interior Minister Bernard Cazeneuve said that seven suspects of Afghan, Morrocan and French origin were arrested in Strasbourg and Marseille. The arrests “enabled us to prevent a long-planned terror attack on our soil,” Cazeneuve told a televised news conference. The raids were carried out on Saturday night and Sunday morning in the eastern city of Strasbourg and Marseille in the south following an eight-month investigation by security services. “Credible information made these arrests necessary,” one security source told AFP earlier, asking not to be named because they were not authorised to speak on the case. Cazeneuve linked the arrests to raids carried out shortly before the Euro 2016 football championship hosted by France in June. The country remains in a state of emergency a year after attacks by Islamic State jihadists on Paris that left 130 people dead. Cazeneuve said 418 people had been arrested for suspected links to terror networks since the start of the year. Strasbourg has been on high alert ahead of the opening of its Christmas market, with local officials warning it could be suspended or cancelled if there were serious threats. The latest travel advisory for France from Department of Foreign Affairs here says travellers should exercise “a high degree of caution” in the country. The same warning applies for Belgium. Irish citizens to Turkey are being urged to consider that “the security environment remains potentially volatile” in the country, and to exercise a high level of caution. Email “The US State Department has issued a terror travel alert for Europe”. Feedback on “The US State Department has issued a terror travel alert for Europe”.